amidst the economic issues and political nausea experienced by the common filipino people, an outstanding debate glanced the local periodicals and trends all across the social media - the existence of rizal monument's photobomber. the question of the photobomber's existence was way more important than the current situation of the filipino people - rampant poverty, less education, political mischiefs, the edsa traffic, the efficiency of MRT and etc, but, of course not to mention the chief executive's hair loss. 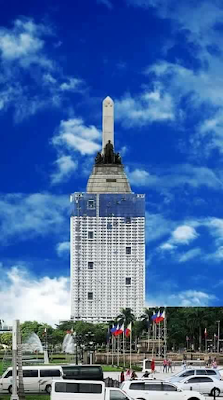 patriotism and respect to the national hero was the main issue claimed by most individuals; torre de manila counterfeits the right of space, where business is business. idiots, intellectual pretenders and some senseless advocates cries for a better solution in response to the heated argumentation on the photobombing if such word exists and the monument itself; one thing unfolds, see illustration above to elucidate the problem.